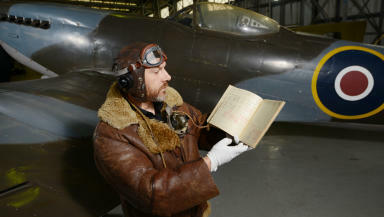 The money, from the Heritage Lottery Fund, will allow uniforms and documents to go on display for the first time. The National Museum of Flight is being given a £1.3m grant to transform two Second World War hangars and create new exhibitons. The money, from the Heritage Lottery Fund, will allow the hangars to be heated and insulated for the first time. This will allow a selection of objects which are currently in storage, including uniforms, documents and photographs, to be displayed alongside the aircraft. Located at former RAF Station East Fortune in East Lothian, the site is considered to be one of the best preserved Second World War airfield in the UK. The £3.6 million project, which will be completed in 2016, will see National Museums Scotland conserve and restore two hangars built in 1940 which originally had a lifespan of just 10 years. Once complete, one hangar will display military aircraft while the other will display smaller commercial and leisure aircraft dating from 1939 onwards. An English Electric Lightning, the RAF's first supersonic jet fighter which could match the speed of Concorde, an RAF Panavia Tornado and a Scottish Aviation Twin Pioneer are among the aircraft which will be on display in the restored hangars, which will close to the public next month. Dr Gordon Rintoul, director of National Museums Scotland, said: "I am delighted that the Heritage Lottery Fund has awarded funding for the next phase of our Development Plan for the National Museum of Flight. "It allows us to restore these important structures, which long ago surpassed their original intended lifespan, and to enhance the visitor experience at what is already one of Europe's major aviation museums, showcasing our internationally significant collections to best effect." Colin McLean, Head of the Heritage Lottery Fund in Scotland, said: "Situated on one of the best preserved Second World War airfields in the UK, these iconic aircraft hangars house over 100 years of aviation history. "With new modern displays and imaginative interactive activities, visitors will gain a greater understanding and appreciation of our national aviation collection. We are delighted to be able to help in this transformation, safeguarding the hangars and the meticulously restored aircraft they house for generations to come." The project comes after it was announced £5m of lottery money would go towards opening new galleries in the National Museum of Scotland in Edinburgh's Chambers Street. Culture Secretary Fiona Hyslop said: "National Museums Scotland holds a collection of national and international importance and is one of the leading museum groups in the UK and Europe. "Following the hugely successful Chambers Street refurbishment project, this very significant development at the National Museum of Flight demonstrates a national museum which is going from strength to strength and always looking to deliver more for the people of Scotland. "This Scottish Government is pleased to be able to support this project and I am delighted that the Heritage Lottery Fund, also one of the main funding partners in the Chambers Street project, is again providing critical support." Further highlights of the collection include one of only two Vulcan bombers ever to have seen military action, a Comet airliner, a Spitfire from the Second World War and British Airways' first operational Concorde.